Facebook has to be a critical component of a B2B & B2C inbound marketing program, but so long as you are doing it right. I saw this quote on a Inc magazine that "62 percent of small business owners say Facebook Ads don't work." While the culprit for this is typically the visuals and copy, others blame the platform not being conducive to ads. 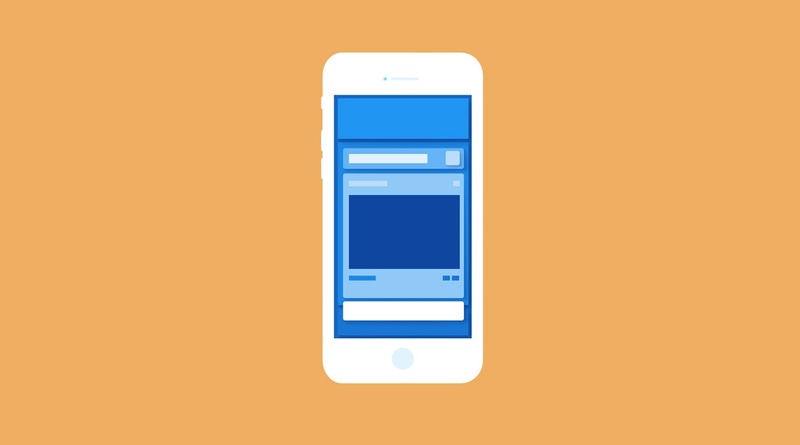 People know you want to go to Facebook to browse, not to be bombarded with ads. But, if that something awesome you show them happens to help with their work, they’ll click on it. That’s what the data tells us about Facebook advertising. So, you might be thinking... "Ok, great! I'll just start scheduling some posts on Facebook and I'll start generating leads." And if this was 2010, that may have worked. Well, it doesn't quite work that way anymore. In the last few years, especially 2018, Facebook has deliberately reduced showing users all content available to them, such as the vast amount of posts from companies that publish frequently. This has been done in an effort to try and show people content from the people whom their friends with, weeding out the over-posting many companies try to do. This means that as a B2B or B2C company trying to generate real business from Facebook, just publishing your content and hoping it gets found organically is no longer good enough. If you really want to get found on Facebook, you need to pay. 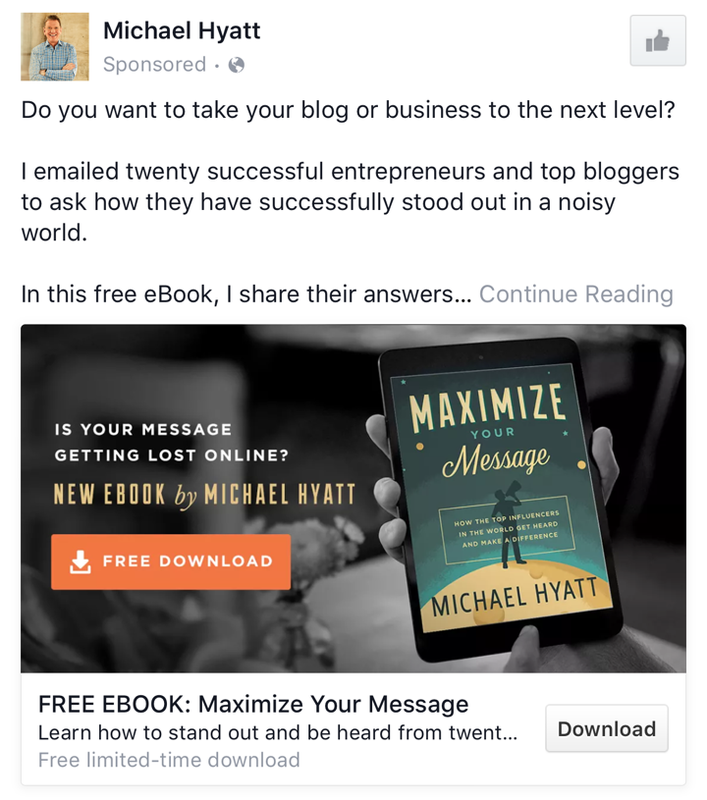 I'm not going to go into all of the nuts and bolts of how to advertise on Facebook in this post. But if you are interested, you can head over hear for a more comprehensive guide! But I do want to share a few ads that I have come across my newsfeed that have caught my attention. Disclaimer: None of these companies are IMPACT clients and I have no data that proves if these ads are effective. This article is completely subjective and only use this post for inspiration only! Airtable hits right on the nose with the problem they are trying to fix - messy spreadsheets. The solution - “something flexible, beautiful”. Adding in the “(dare we are it) fun” makes the ad seem that less salesy. It also peeks interest, what would this product be that is has the ability to turn spreadsheets into something fun? It’s clear this image isn't from a stock photo and is more than likely (unless you are already familiar with the brand) designed specifically for Airtable. Making it dynamic and unusual, especially using imagery that doesn’t directly relate to the product, can sometimes really draw the users attention. Although the image appears to be real code (and instantly intimidating) it's really just a playful use of code that reads as sort of ‘secret message’. 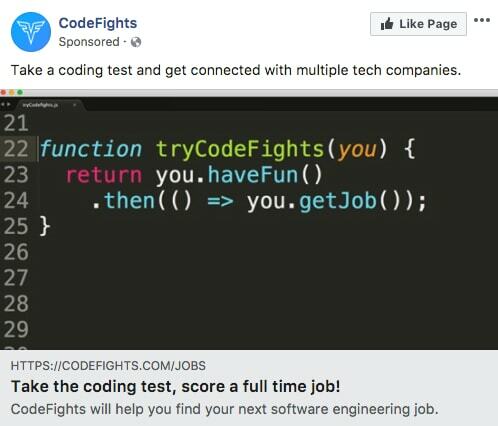 Try Codefights, have fun, and then, you’ll get your job! As a web developer, the code formatting and image instantly grabbed my attention, but ultimately created a delightful experience when I realized the wordplay it used. If you pass their test, they will connect you with companies that are best suited for your skillset. Makes you think how it can make your job search that much easier. The first 3 words immediately let you know that the product helps create a more cohesive communication experience with your colleges and on projects. The statistic (88% of Glip users are more informed..) also helps adds further value to the product; if Glip has helped that many of its users, why wouldn’t it help yours? 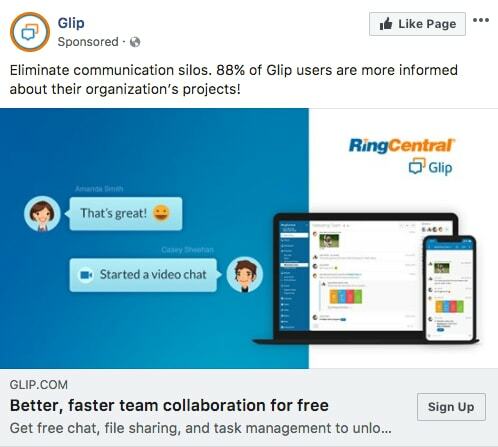 While the image provides you with context as to what the product potentially is (my initial guess is a chat platform) the content below the image reaffirms that. Better yet, they even inserted the word ‘free’, which can be attractive for those looking for a chat and task management product on a budget. The content cuts to the chase immediately and lets you know you’re getting a report on the top 100 email strategies. 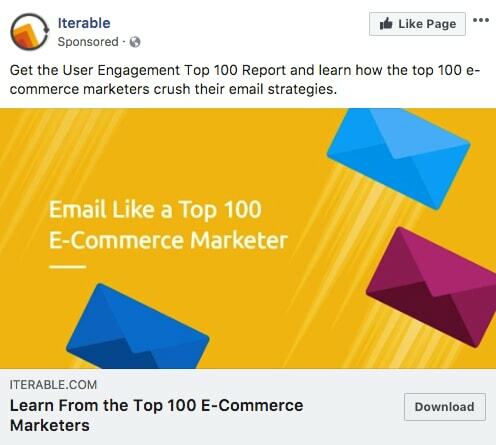 Along with that, who wouldn't want to know the top 100 e-commerce marketers are doing to crush their email strategies? The quantity also makes the offer that much more attractive. 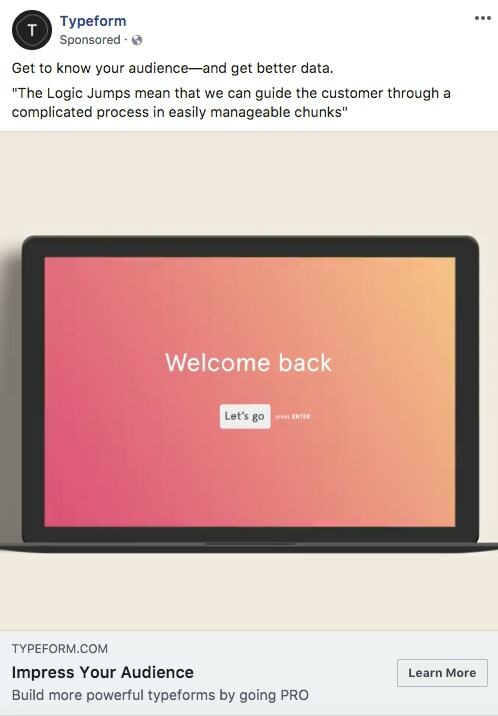 The letters hint at an email-based ad before you even read the content within the image. Adding the beautiful colors, especially against a yellow background, aid in helping the image stand out. This ad works best for people who are already familiar with the Typeform product and are currently on the free version but may not know the full functionality of the ‘Pro’ tier. This ad uses a dynamic video to explain one of those features, called Logic Jump, which enables users to add question branches, forks, or conditionals. The video ultimately helps explain the capabilities Logic Jumps have, which for something more complex, can help add context that is easier to understand and a simple image. Although the quote doesn’t have a name or face next to it, putting it in the content helps add more context to the feature. This quote also addresses a solution that people could be struggling with when making forms currently. 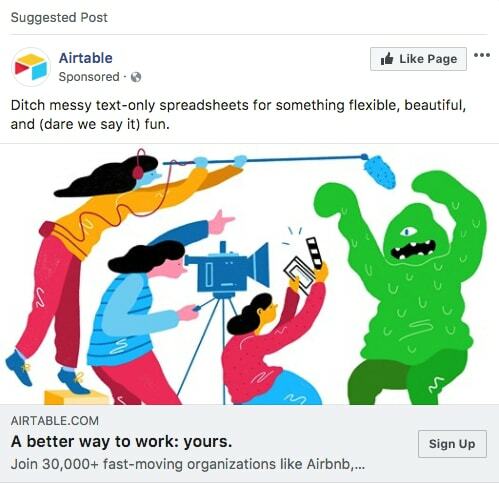 The description at the top of the ad helps add context to what Workplace by Facebook does. Listing exactly what you get too helps decrease the chances of users guessing what Workplace does. 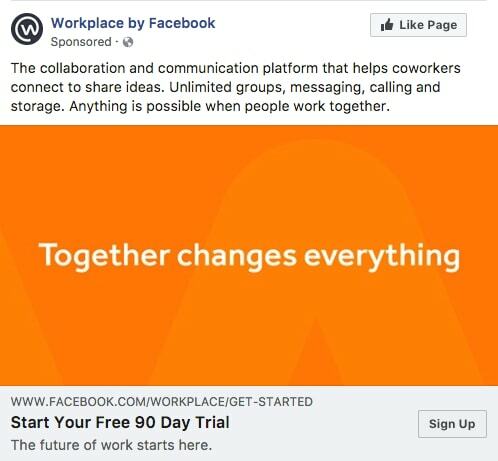 It may not be a picture of Workplace, but the bold orange is a sure-fire way to draw more eyes to the ad, over something that’s blue that could potentially blend in with Facebook branding. The initial question peeks interest for those who are in the UX field, and if you choose to keep reading before clicking through, you can’t help but be impressed finding out that people talking their program have been mentored from a few well-known companies. Like a few other examples, this image feels less stocky and more custom to the Springboard brand. The pink and green contrast also makes it stand out against the white backdrop it’s set in. 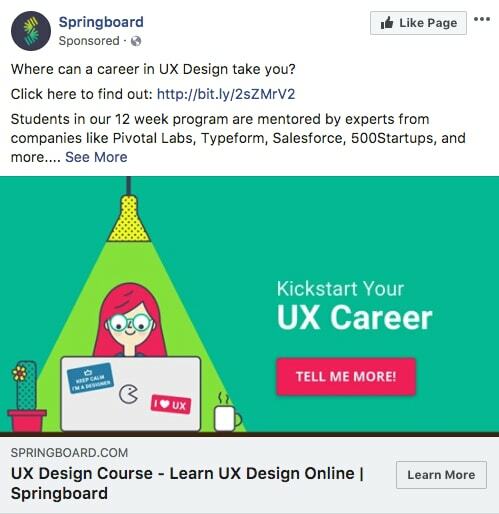 The description next to the button says it all - clicking through will help you get started on a design course that will take your UX career to the next level. Clearly defines who it's for: Small to mid-sized businesses. 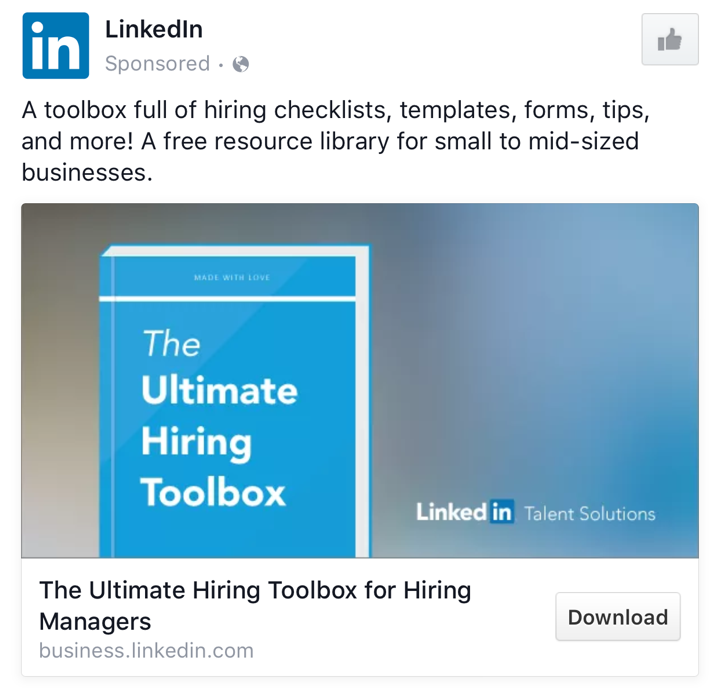 Clearly articulates what you get: A toolbox full of hiring checklists, templates, forms, tips, and more. Visual is clear: It's a downloadable piece of content. Has a clear call to action: Download. 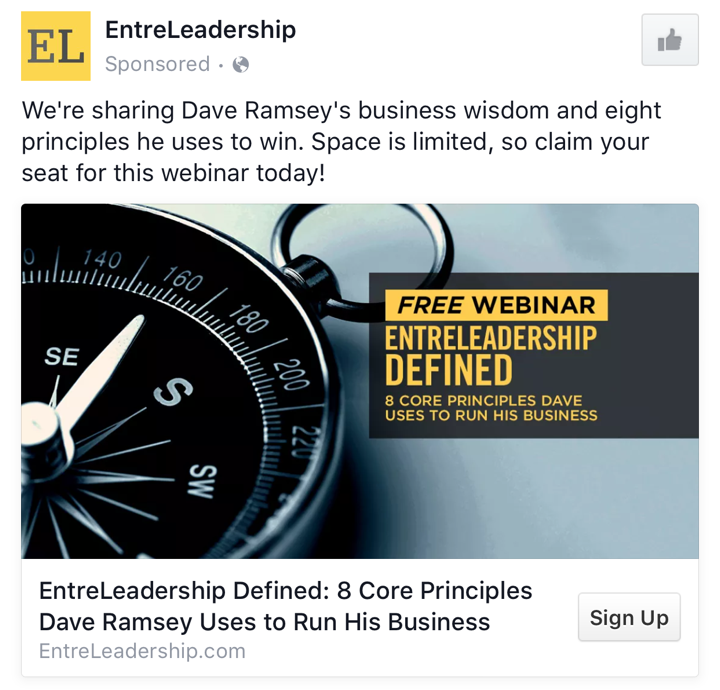 Strong value proposition: We're sharing Dave Ramsey's business wisdom and eight principles he uses to win. Has urgency: Space is limited. Clearly defines the Offer: It's a webinar. Has a clear call to action: Claim your seat for this webinar today > Sign up. 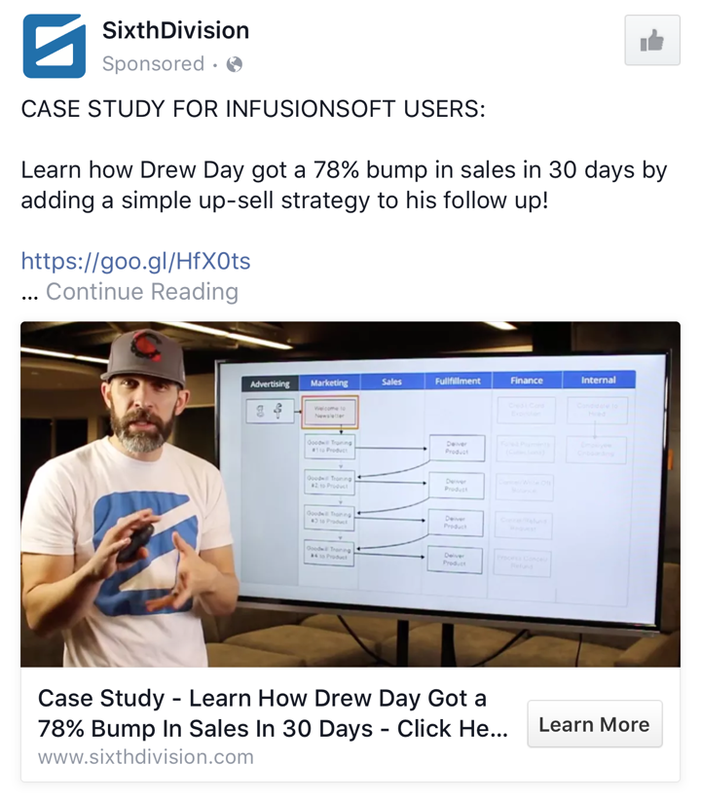 Very strong value proposition: Learn how Drew Day got a 78% bump in sales in 30 days by adding a simple up-sell strategy to his follow up! Creates anticipation: I want to know what that one thing is! A real person in the picture adds credibility. Has a clear call to action: Learn More. Question piques interest: Do you want to take your blog to the next level? Clearly articulates what you get: Answers to how twenty successful entrepreneurs and top bloggers successfully stand out in a noisy world. Strong visual: Clearly shows it's a beautifully design, professional ebook. Has a clear call to action: Free download (I like that they included the word free). 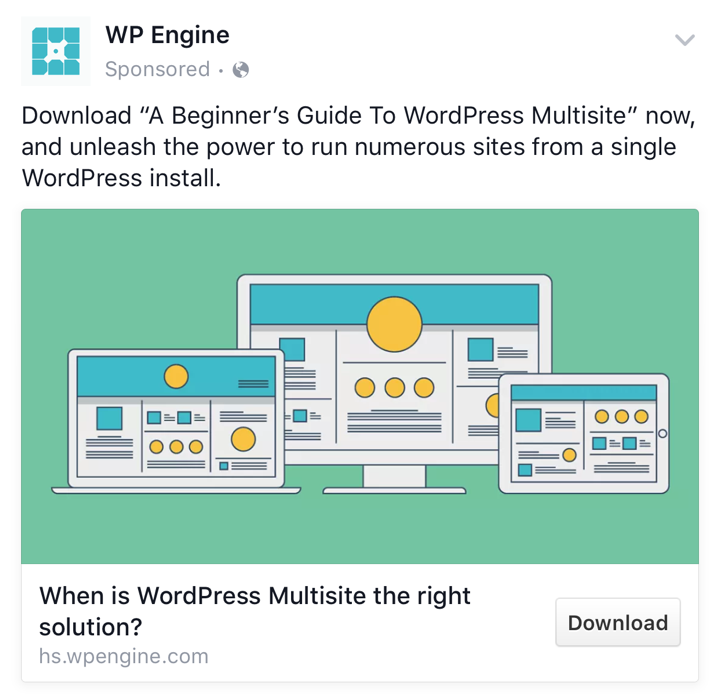 The value proposition is clear: Unleash the power to run numerous sites from a single WordPress install. Visual catches your eye: The colors pop and the yellow circle in the middle draws your eye into the ad. 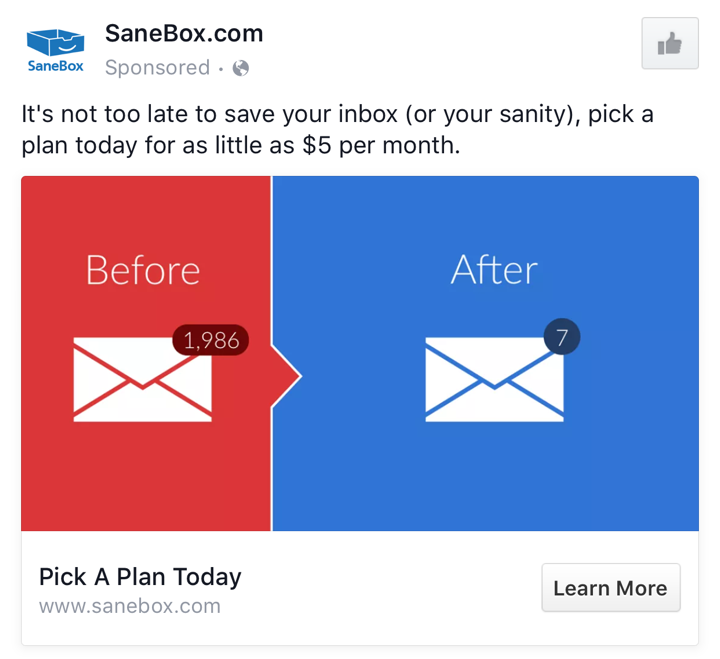 Clear value proposition: Save your inbox (or your sanity). Visually represents the value: Before: Way too many unread emails. After: Much fewer emails to read. If you're B2B and you're looking for new ways to increase your lead generation, give Facebook advertising a try. Focus on attracting leads early in their buying process with top-of-the-funnel content, clearly articulate the value of the content and make sure theirs a clear call to action. If you're stuck any need help, reach out. I'll be happy to help you develop some Facebook advertising strategies. 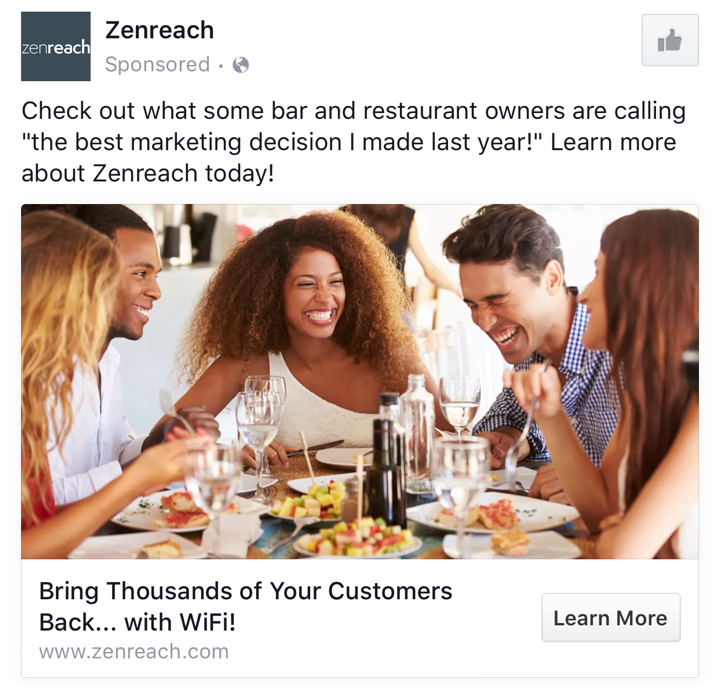 Facebook Advertising is Not Just For B2C.